When we talk about ‘communication’, we often mean ‘what we say’: the words that we use. However, interpersonal communication is much more than the explicit meaning of words, and the information or message that they convey. It also includes implicit messages, whether intentional or not, which are expressed through non-verbal behaviours. Non-verbal communication includes facial expressions, the tone and pitch of the voice, gestures displayed through body language (kinesics) and the physical distance between the communicators (proxemics). These non-verbal signals can give clues and additional information and meaning over and above spoken (verbal) communication. Indeed, some estimates suggest that around 70 to 80% of communication is non-verbal! Reinforce or modify what is said in words. For example, people may nod their heads vigorously when saying “Yes” to emphasise that they agree with the other person. A shrug of the shoulders and a sad expression when saying “I’m fine, thanks” may actually imply that things are not really fine at all! We know how people feel from their non-verbal communication. If you have ever watched a couple sitting talking, you may have noticed that they tend to ‘mirror’ each other’s body language. They hold their hands in similar positions, they smile at the same time, and they turn to face each other more fully. These movements reinforce their relationship: they build on their rapport, and help them to feel more connected. Smiles and nods tell someone that you are listening and that you agree with what they are saying. Movement and hand gestures may indicate that you wish to speak. These subtle signals give information gently but clearly. There are a number of signals that we use to tell people that we have finished speaking, or that we wish to speak. An emphatic nod, and firm closing of the lips indicates that we have nothing more to say, for example. Making eye contact with the chair of a meeting and nodding slightly will indicate that you wish to speak. Many popular books on non-verbal communication present the topic as if it were a language that can be learned, the implication being that if the meaning of every nod, eye movement, and gesture were known, the real feelings and intentions of a person would be understood. This, of course, is absolutely true. Unfortunately interpreting non-verbal communication is not that simple. As our Interpersonal Communication page, non-verbal communication is not a language with a fixed meaning. It is influenced and driven by the context in which it occurs. This includes both the place and the people concerned, as well as the culture. For example, a nod of the head between colleagues in a committee meeting may mean something very different from when the same action is used to acknowledge someone across a crowded room, and again when two people are having a social conversation. Non-verbal communication may also be both conscious and unconscious. Facial expressions are particularly hard to control, because we cannot see ourselves to know what we are doing. We may, therefore complicate communication by trying to convey one message consciously, while in fact conveying quite another unconsciously. Interpersonal communication is further complicated because it is usually not possible to interpret a gesture or expression accurately on its own. 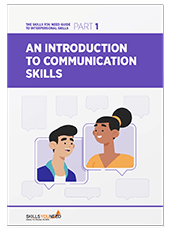 Non-verbal communication consists of a complete package of expressions, hand and eye movements, postures, and gestures which should be interpreted along with speech (verbal communication). Over the years, many people have argued that written words also contain non-verbal communication. Your handwriting can give clues about how you were feeling when you wrote a note, for example, and nowadays, your choice of font and colour also says something about you. However, it is now generally agreed that these forms of non-verbal communication are pretty unreliable indicators of character. They convey far less information than the non-verbal communication that is part of face-to-face interactions. The good news is that most of us learn to interpret non-verbal communication as we grow up and develop. It is a normal part of how we communicate with other people, and most of us both use it and interpret it quite unconsciously. This can make it harder to interpret consciously. However, if you stop thinking about it, you will probably find that you have a very good idea of what someone meant. The bad news is that non-verbal communication can be very culture-specific. The popular stereotype of Italians, involving big gestures, lots of hand-waving, and plenty of loud and excited shouting, may be a stereotype, but it exists for a reason. In the Italian culture, excitement is shown a lot more obviously than in the UK, for example. Non-verbal communication tends to be a lot more obvious. This can make it much harder for Italians to interpret non-verbal communication in the UK or USA, where it is more subtle. However, even in Italy, there are geographical variations. The thumbs-up gesture, which generally signals approval in English-speaking countries, is considered offensive in other countries, including apparently Greece, Italy and some parts of the Middle East. Making a circle with your thumb and forefinger like this means OK in Western cultures. It is used in particular by divers in this way. In Japan, however, it is reputedly the sign for money, and in Arabic countries, it is a threat. It’s worth being careful how you use gestures and body language! For more about this, see our pages on Intercultural Communication and Intercultural Awareness. It is essential to remember that non-verbal cues can be as important, or in some cases even more important, than what we say. Non-verbal communication can have a great impact on the listener and the outcome of the communication. People tend to have much less conscious control over their non-verbal messages than of what they’re actually saying. This is partly because non-verbal communication is much more emotional in nature, and therefore much more instinctive. If there is a mismatch between the two, therefore, you should probably trust the non-verbal messages, rather than the words used. A lack of non-verbal message may also be a signal of sorts, suggesting that the speaker is carefully controlling their body language, and may be trying to hide their true emotions. Physiological changes, for example, you may sweat or blink more when you are nervous, and your heart rate is also likely to increase. These are almost impossible to control consciously and are therefore a very important indicator of mental state. There is more about all of these types of non-verbal communication on our pages on Body Language and Face and Voice. 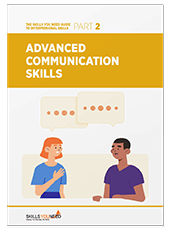 Non-verbal communication is an extremely complex yet integral part of overall communication skills. However, people are often totally unaware of their non-verbal behaviour. A basic awareness of non-verbal communication strategies, over and above what is actually said, can help to improve interaction with others. Knowledge of these signs can be used to encourage people to talk about their concerns and can lead to a greater shared understanding, which is, after all, the purpose of communication. Conversational Skills | What is Charisma?